Carter, governor of Georgia from 1970-74, emerged from relative obscurity among a fairly splintered Democratic field in 1976 and against a bevy of more experienced and nationally prominent political figures. Competitors ranged from Senators Birch Bayh of Indiana, Henry “Scoop” Jackson of Washington, and Frank Church of Idaho (a late entry) to Rep. Morris Udall of Arizona, Alabama Governor and 1968 third-party presidential nominee George Wallace, 1972 Democratic vice presidential nominee Sargent Shriver, and former Senator Fred Harris of Oklahoma. The only candidate less established than Carter was 37-year-old California Governor Jerry Brown who, like Udall, took up the mantle of “maverick liberal” from the West as part of his strategy against a large and stylistically diverse field and did not even enter the race until May 1976. Carter wanted to avoid the regional pigeonholing that had plagued past hopefuls from the Deep South, including Georgia’s own Richard Russell 24 years prior. He was especially wary of seeming like a mild-mannered clone of fellow Southerner Wallace, who had made his name obstructing civil rights laws and promoting segregation in the 1960s. Toward this end, Carter sought the endorsements of prominent black politicians and de-emphasized his center-right ideological record as governor, instead focusing on his image as a “fresh face” with unquestioned ethical credentials. In the post-Watergate political milieu, this marketing proved effective; Carter startled forecasters by placing second only to “uncommitted” in the Iowa caucuses, with 28 percent of the vote to Bayh’s 13 percent and Harris’s 10 percent. More shockingly, Carter polled the same in New Hampshire, besting Udall’s 23 percent, Bayh at 15, Harris at 11, and Shriver at 8. That a largely untested candidate from Dixie could win in New England stunned the party establishment, and Bayh in particular lost momentum. Carter would win another New England state, Vermont, the next week, though he placed fourth in Massachusetts the same day. 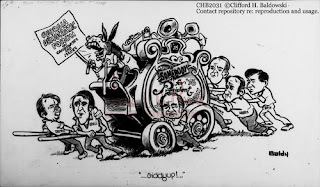 Above: This depicts the "Somebody for President '76 Bandwagon" being driven by a Democratic donkey holding a "Georgia Democratic Forum on Candidates and Issues" sign. Jimmy Carter and Morris Udall are pulling the bandwagon while Milton Shapp, Sargent Shriver, Fred Harris and Birch Bayh are pushing it. Clifford H. (Baldy) Baldowski Editorial Cartoons, Russell Library. Carter more or less knocked Wallace out of the race after March victories in Florida, Illinois, and North Carolina, establishing himself as the main Southern candidate while still beating a nationally popular drumbeat of clean government. By the start of April, Carter’s main threat was Udall, who drew support from constituencies with whom Carter was having trouble “closing the deal”—social liberals in Northern and Western states, many suspicious that Carter was some kind of stalking horse for the party’s old-line Dixiecrat wing. Jackson, an accomplished statesman, was still viable in certain pockets of the Northeast. But Carter managed to best Udall in such reputedly liberal places as Wisconsin, D.C., and Connecticut. By then, two more candidates appealing to the “Anyone but Carter” movement, Church and Brown, entered the race and accrued victories in Nebraska, Maryland, and Nevada, while Carter held firm to his Southern base and edged past Udall in labor-heavy Michigan. By then, Carter’s lead in delegates was all but insurmountable even as Church and Brown showed signs of life out west. Coming at the tail end of a two-decade period of desegregation and advances in both racial and gender equality, Carter’s victory in claiming the Democratic nomination could be seen as a sign that the dominance of Northern “machine” Democrats had faded. Alternatively, it could have shown that Southerners could win nationwide office in the 1970s by running positive, candidate-focused efforts and overtly eschewing offensive “dog whistle politics.” In any case, Carter unseated President Gerald Ford in a close election with 50 percent to the latter’s 48 percent and a 297-240 electoral college edge. Much as in the Democratic primaries, Carter dominated the South, losing only one state of the old Confederacy (Virginia), but also ran well north of the Mason-Dixon Line, roughly splitting the industrial Northeast and Midwest with Ford (a native of Michigan) and winning such crucial states as New York, Ohio, and Pennsylvania. Just as before, he was weakest west of the Rockies, winning only Hawaii.